Add all ingredients into mixing glass with ice. Quick stir for three seconds to chill cocktail without over-diluting. Strain into old fashioned glass with ice lump. 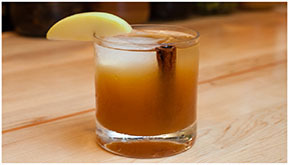 Garnish with apple slice and cinnamon stick. In a medium saucepan, bring the water and sugar to a boil to make a simple syrup. Add the cinnamon and vanilla in the water. Let it boil for 2 minutes, then sit for 1 hour, and strain. In batches, combine the coconut, evaporated and condensed milks, slowly adding the cinnamon syrup. Add the rums and mix well. Transfer the mixture to a large plastic container and refrigerate overnight. 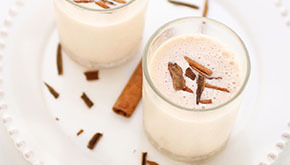 Prior to serving, use a blender to blend the coquito. Serve chilled with freshly grated nutmeg. Mix over ice in a Tom Colllins glass. Serve with a cherry and a lemon slice. Heat gently and pour into a coffee mug. Bring the sugar and the spices to the boil, with 1 cup of water. Add the pineapple and the cranberry juice with the remaining water and bring to another boil, then let simmer for 5 to 10 minutes. Top with the butter, stir well, and serve in mugs. Garnish each mug with 2 cinnamon sticks. In a double boiler, melt the solid chocolate, the sugar and the salt. Stir in boiling water and continue to heat until the mixture is well blended and hot. Add the coffee, the cream and stir well. Finish by adding the vanilla and the cinnamon and pour into mugs. Blend all ingredients at medium speed until smooth. Mix all ingredients with hand mixer until well blended. You can freeze it in a plastic container. Stir the milk with the chocolate and the cinnamon over low heat until the chocolate dissolves. Add the eggs and beat the mixture until it becomes thick, taking care not to boil.